Soak the noodles in warm water for 10 minutes, drain well, and set aside. Heat the oil in a wok and stir-fry the garlic, chilies, and pork for 2-3 minutes. Add the shrimp and stir-fry for an additional 2-3 minutes. Add the chives and noodles, then cover and cook for 1-2 minutes. Add the fish sauce, lime juice, sugar, and eggs. Cook, stirring and tossing constantly to mix in the eggs. Stir in the bean sprouts, cilantro, and peanuts, and serve with small dishes of crispy fried onions and extra chopped peanuts. 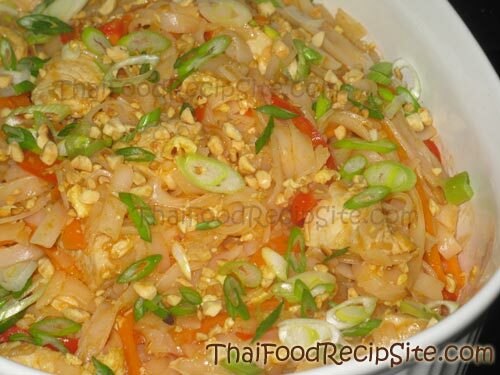 Ttry the other version of Pad Thai Recipe.